Being an Iced Earth fan without being an Iced Earth fanboy is increasingly difficult for us noble few. Everyone loves the earlier days, of course, up until Horror Show the band being the personification of those Iron Maiden-gone-thrash fantasies that we all have from time to time – but 2004’s The Glorious Burden split metalhead opinion, and it has stayed split since. Jon Schaffer had some kind of philosophical change that unleashed the inherent flag-waving American patriotism always lurking beneath Iced Earth’s skin, allowing it to roam free. Personally, I admire Americans for their passion and patriotism; over there, the eagle cries, man! It makes for far better raucous heavy metal than does the stoic British upper lip and quiet expectations of duty. It’s also my excuse, if one is needed, for enjoying The Glorious Burden, and I loved both Framing Armageddon and The Crucible Of Man despite the dramatic vocalist changes. Schaffer has the knack of injecting his music with emotion in a way that elevates it, and his choice of vocalists has always seemed driven by the desire to maximise this. 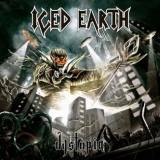 Yet these latter day albums are quite clearly a step away from what all of the band’s fans, deep down, would like to see from Iced Earth – the ripping, thrashy, metallic perfection that we are shown glimpses of but never granted full access to. It’s the same dilemma that every metalhead faces with the latest album from a long-running act. Give praise for what it is, or lament for what it’s not? I’ve always tried to follow the former course, and look for enjoyment rather than disappointment, and so from that viewpoint can say that Dystopia is a more than solid effort that will please fans. Into Eternity’s Stu Block has the unenviable task of living up to the high bar set by Matt Barlow, and would be forgiven failure; yet he does marvellously, showing range and skill and carrying both material and listener along with the sort of fist-pumping metal grandiosity that is synonymous with Iced Earth’s name. As expected, this isn’t a pure thrash album, but a varied and well-written heavy metal record that tackles both headbanging and balladry with the same enjoyable results. The opening track simply rips in, an unsettling scream from Stu setting you up for an infectious rampage through fist-pumping heavy metal territory, complete with a falsetto chorus that will at first annoy and then beguile, eventually impossible to get out of your head. This album is a real grower; you may initially be left cold by pseudo-ballads like Anguish Of Youth and End Of Innocence, but a couple of listens down the line the heart and soul behind the songs comes through. And of course, with metallic rippers like Boiling Point and V everywhere else, you won’t be left long without a killer riff or three. For this album isn’t just solid, it often ascends into sheer excellence, moments like Dark City’s epic, prog-touched gallop and Tragedy & Triumph’s gloriously brilliant stomp-a-long – the latter especially being one of the best Iced Earth songs ever, an anthem for post-apocalyptic humanity that focuses on the hopeful future than the depressing past. The one slight disappointment is the brief and repetitive Days Of Rage, feeling a little filler-y and tacked-on compared to the other tracks. Yet it’s a small criticism, and when all is said and done Dystopia is a pretty killer album; perhaps not quite up there with the band’s past, but a very good showcase for their present. Get the special edition for the bonus tracks, including the great Soylent Green!